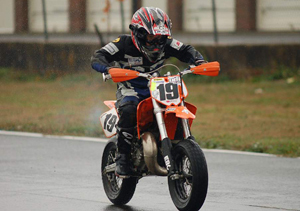 Just wanted to let you know that Blake won both of his supermoto season championships, PeeWee and Formula Mini! Your school was excellent for him, thankyou for being so patient with the kids..you obviously have created a format that works. We never have gotten a chance to practice those figure-8s yet, but I definately see him using the attack position all of the time riding at home (that part really stuck with him) and at least keeping his elbows up when racing on the pavement. Attached are a some good pictures..sorry, a few are kinda big...but you're free to use them if you wish. Keep us in mind when you need riders to fill a class, OK?